Magdalena Andersson, the Governor of Västerbotten, visited Envigas in Bureå to be shown the newly inagurated BioCarbon plant. EnviGas from the city of Skellefteå was a shared winner at Tuesday's presentation competition, which was held at the Grand Hotel in Stockholm. The first-place award was shared with the company Caicla from Umeå city. The competition was arranged by Connect with Cleaner Growth, five companies specialized in sustainable energy / environment made it to the finals in Stockholm. Each company conducted a three-minute presentation in front of more than 40 investors that was acting as judges in the competition. The investors evaluated the companies based on entrepreneurship and potential, Envigas presentation impressed the investors enough to earn the split first-place. In MoDo's factory in Bureå, which was closed down in 1992, a full-scale demonstration plant will be built with a unique process for the production of bio char. 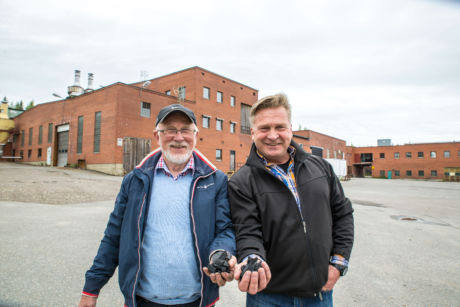 Behind the venture is the Skellefteå based company Envigas AB, which was started 2013 by local entrepreneurs Harry Johansson and Håkan Holmberg. Initially two people will be employed to build the plant, and two more people will be hired this autumn & more to follow as the company grows. The plant will be used to demonstrate the use of different fuels and alternative areas of use for the final product, "said Harry Johansson, Technical Director of Envigas in a press release.